The municipal government headed by Mayor Arturo Davalos Pena offered a well-deserved recognition to the teachers of Puerto Vallarta on the occasion of Teachers Day and confirmed that he is an ally of education, announcing the programs of "Safety in Schools" and "Schools of Quality", both with municipal resources. The municipal government welcomed the teachers with a dinner dance attended by about 2,200 teachers who the municipal president congratulated and expressed that "this small tribute is with much heart-felt affection with all respect for the work they have done in educating and teaching." The mayor announced two very important programs that will benefit the education sector, the first one being "Safety in Schools" which will consist of installing alarm systems in 50 schools of basic education where there are classes in both shifts. The alarms will be connected to the Directorate of Public Security, the campus director and two other telephone contacts. The second program is "Schools of Quality" which was formerly state and federal funded, but it disappeared "and now with great effort we are rescuing it and now it will be a municipal program and we will support 50 schools with 10 thousand pesos with educational materials. This is how the government of Vallarta reaffirms that it is an ally of education, "these two programs are due to the efforts of the City Council and we are very fond of promoting education," he said, and it will continue to support families to avoid dropping out of school by providing all basic level students with supplies, backpacks, uniforms, shoes, as well as school accident insurance. The teachers of Puerto Vallarta enjoyed a pleasant evening while singing their favorite songs along with the New Continental Mariachi and the teachers danced to the varied rhythms of the versatile group Farra. There was a raffle of a 2017 model car accompanied by representatives of education, councilors, and DIF among the honorees. 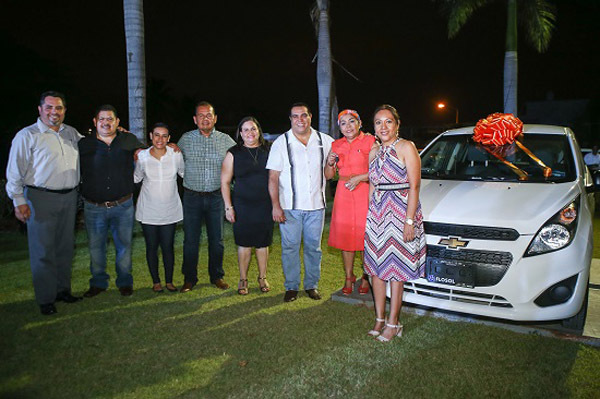 It was undoubtedly one of the moments of greatest emotion and the lucky winner was teacher Miriam Rocio Valezquez Flores, who has been teaching at the Jose Clemente Orozco kindergarten for seven years. She is originally from Rosa Morada, Nayarit where she began her teaching career in 1986 and arrived in Puerto Vallarta in 1991.